If the trees around us get all pretty and put up their spring dress, why shouldn't we? And why shouldn't our purses and handbags? Following my pledge (I'm crossing my fingers behind my back) that I would finish my current project(S) before get more supplies for the new one, and eventually make something out of what I already have (enough) to try to reduce my stash, I did well. I didn't buy anything because I had everything on hand: bits and ends that, I'm positive, you have here and there as well. I ended up making lots and lots of tiny things, in very little time, and I'm quite happy with the results. ... Nothing like a swiveling charm to make your purses charmed. and the more you look at it, the more you want. I've got carried away, indeed. thanks! I'm still learning (and not very good at it) but i'm improving, it's a start! WOW these are SO cute!! What a great idea! I found you through Craft O Maniac! P.S. I am hosting a giveaway on my blog right now for free hair accessories! I would love for you to come by and enter! Over the top chic! They'll be lookin' atcha! thank you girls!! wanna know my husband comment? 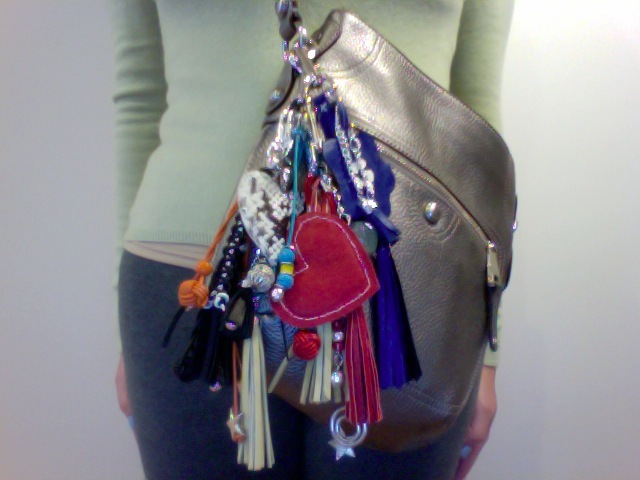 "you've got something hanging from your bag, your habit of never close your purse" ... oh, ...men. Love them!! Your purses will be the most gorgeous on the block!! thanks Daniella!!! i'm working on it ! AH!! These are cute too! I saw them linked up to Debbie's as well, but hadn't been that far down her list yet....now I can skip it since I have already been there! Way to go, creative girly!